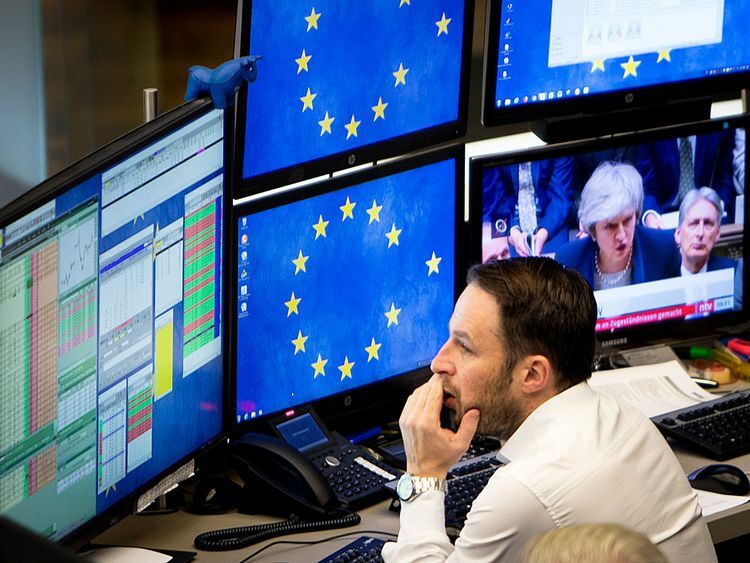 LONDON: World equity markets on Wednesday rode out the heavy parliamentary defeat for British Prime Minister Theresa May’s Brexit deal, as investors saw potential for legislative deadlock to force London to delay its departure from the EU. May’s government faces a no-confidence vote on Wednesday after the shattering rejection left Britain’s exit from the European Union in disarray. As a result, they are increasingly betting on Britain being forced to postpone its planned March 29 exit, though few have any clarity on what that would mean for the country in the longer run. There, stocks were also lifted by signs that China will take more steps to bolster its slowing economy and the US Federal Reserve may pause its run of interest rate rises. “So there’s a strong probability of an extension of Article 50 and that means there’s an increased probability of a softer Brexit or no Brexit at all.” With some expecting a delay to raise chances of a softer Brexit, for example based on the opposition Labour party’s idea of membership of a permanent customs union, sterling was flat against the dollar at $1.2860. “Volatility is expected to remain high, but we do think that there is upside for sterling. Sterling is very cheap on the long-term basis, partly because of the probability of the no-deal Brexit.” The MSCI world equity index, which tracks shares in 47 countries, was flat, while MSCI’s main European Index gained 0.3 per cent. Britain’s leading equity index fell 0.1 per cent in early trade, lagging European stocks which climbed 0.2 per cent. The broader Euro STOXX 600 was up 0.3 per cent, while indexes in Germany, France and Spain all rose. Earlier in the day MSCI’s broadest index of Asia-Pacific shares outside Japan ticked up 0.2 per cent, with South Korea’s Kospi and Hong Kong’s Hang Seng both scaling six-week highs. TRADE TALKS Asian shares had responded well to China’s central bank injecting a record amount of money into the country’s financial system. That underscored Chinese officials’ commitment to signal more measures to stabilise a slowing economy. Global markets have drawn succour from the resumption of Sino-US trade talks, though scepticism over the absence of detailed progress was underlined overnight as the US trade representative that he did not see any progress made on structural issues during US talks with China last week. Investors are also betting that the US Federal Reserve will slow its interest rate hikes. On Tuesday US policymakers agreed the Federal Reserve should pause further rate hikes until it is clear how much the US economy will be held back by larger risks like slowing growth in China. Investors “are mainly focused on the outcome of the US-China trade negotiations, but it may take more than a month before it will become clear,” said Ayako Sera, market strategist at Sumitomo Mitsui Trust Bank in Tokyo. The dollar fell 0.1 per cent against a basket of six major currencies to 95.921, and lost 0.1 per cent against the yen at 108.58 yen. The euro was steady against the dollar at 1.1418. The single currency has lost nearly 1.5 per cent from a 12-week high hit on Jan. 10. Long-term US. Treasury yields dropped to an 11-month low of 2.543 per cent at the start of January but have bounced back above 2.70 per cent. Oil prices firmed after climbing about 3 per cent in the previous session as expectations that Opec-led supply cuts will tighten markets despite signs of a global economic slowdown. Brent crude oil futures were at $61.17 per barrel at 0904 GMT, 0.1 per cent above their last close.